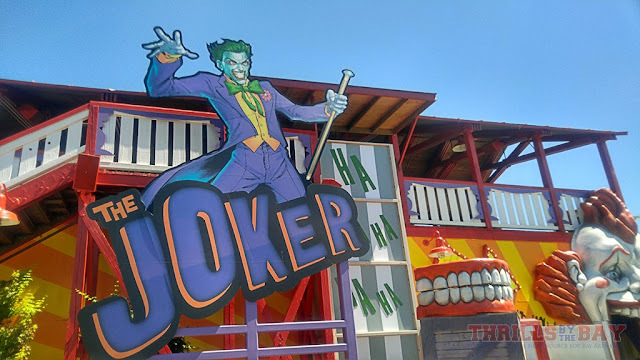 Thrills by the Bay: The Joker Ride Review! New RMC coaster at Six Flags Discovery Kingdom! 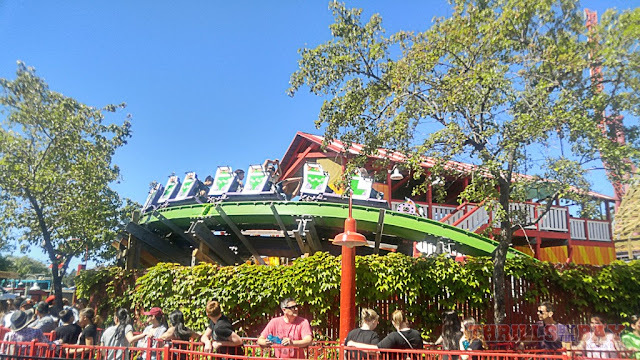 The Joker Ride Review! 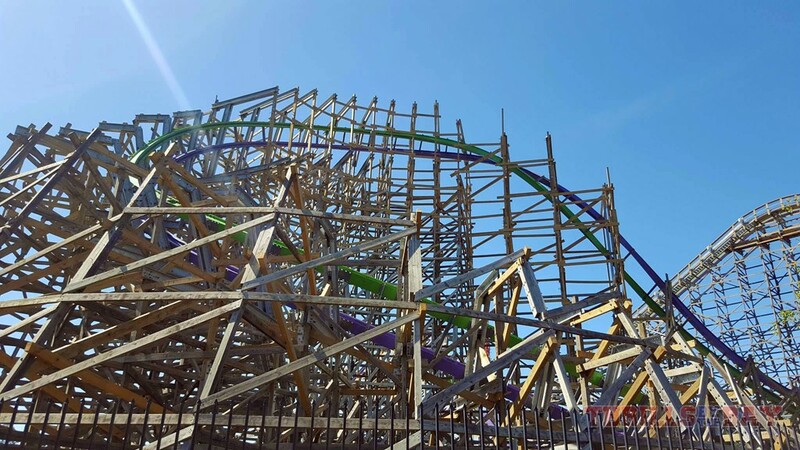 New RMC coaster at Six Flags Discovery Kingdom! Back in September Six Flags Discovery Kingdom surprised all of us with the announcement of The Joker - the Rocky Mountain Construction hybrid conversion of the former Roar roller coaster. 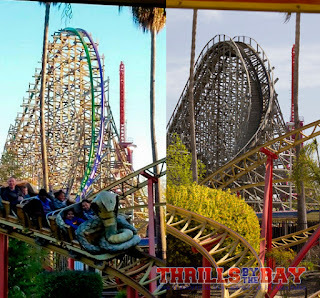 Roar had seen better days (Ride was amazingly smooth its opening year, we had rode it a few months after its opening day). Unfortunately Roar was in pretty bad shape right down to feeling what felt like a pothole at the bottom of the initial drop. Easiest solution was to give the coaster the "RMC treatment." 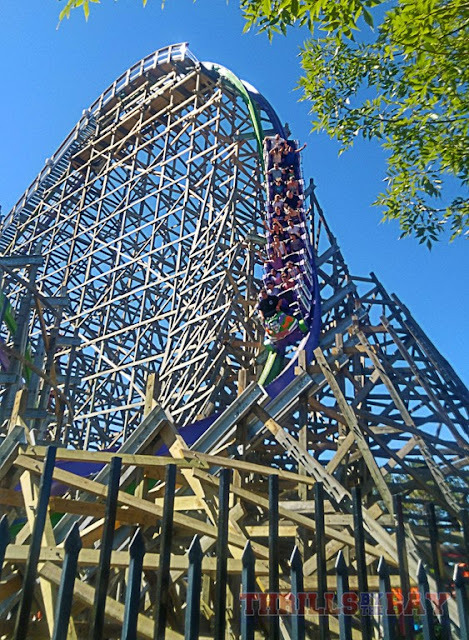 The ride originally was set to open Memorial Day Weekend but has been experiencing some difficulties and all-day closures as well as single train ops for the past few weeks. 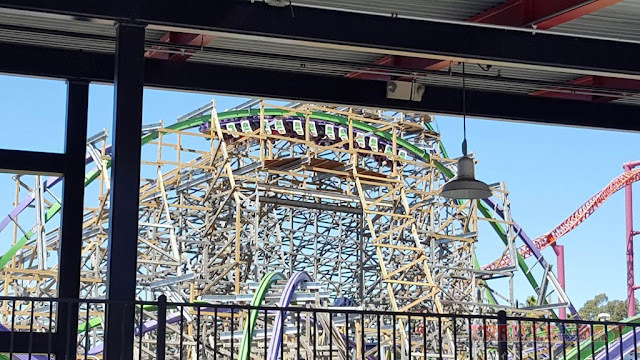 Several other RMC coasters around the nation and internationally have also had a rocky start, hopefully those will be running soon. 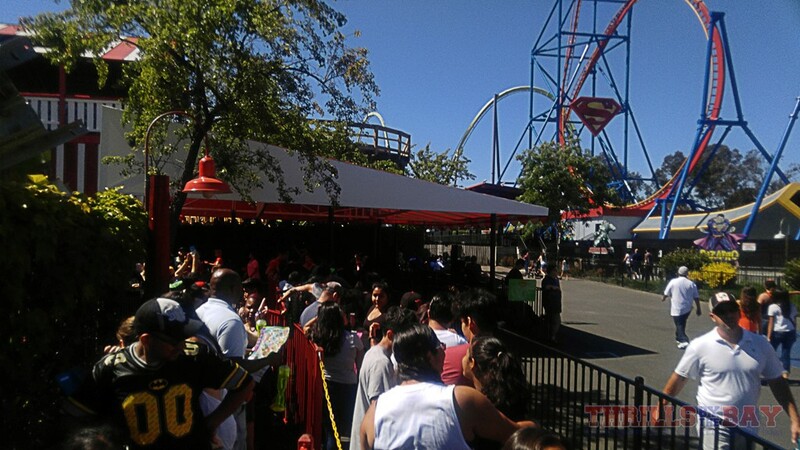 In our case, we decided it was best to wait this out a bit to let the kinks get worked out, and check with the park whether if it is back up and running before taking the trek up to Vallejo (Thank you Six Flags for quick response on letting us know!). To our surprise, The Joker was running both trains and from the times we were in line to ride it, had only quickly gone down and back up twice. With this said, we managed to squeeze in 5 rides on it on this moderately busy summer Saturday (which was also a Bring the Friend day for season pass holders). Before we get to talking about the ride experience, let's talk about what you'll be doing before you ride. Average wait times with a partially filled queue was about 40-45 minutes, dispatch times were average. Riders are instructed to put on their seatbelts but leave the lap bars up which slows things down a bit. Several riders throughout the day were denied their rides as some of the rows (towards the middle on the green train) appear to have really picky lap bar sensors - needing to be much tighter than the rest of the rows. Riders of an average body build, not necessarily overweight, ended up not getting to ride after their 45 minute wait which is really a shame. Especially if they rode it earlier in the day with no problems. Some shade, the queue could use more though as during the morning you will be baking in the sun. Giant 3d sculpted clown mouth looks really good! The queue itself has partial shade but has a stretch of switchbacks out in the sun. A very light and repetative carnival/funhouse music loop plays. Fortunately it's fairly quiet so you won't feel like going insane after hearing it for that hour in line. 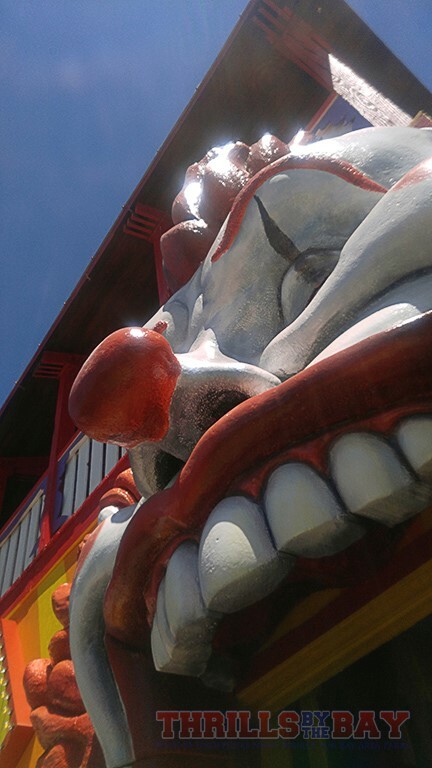 Before you know it though, you're approaching the large clown's mouth and on your way up to the ride platform. You are treated with a nice view of the pre lift of the Joker. ....many requesting to ride it again! The ride itself was insane and a solid coaster to the SFDK coaster lineup. Starting out with the pre-lift, the Joker lets you know immediately that this ride is no joke when it comes to airtime. The first hump as you turn out of the station actually gave us some mild ejector airtime in the front row and in the back and was a complete surprise and different contrast to its cousin, Twisted Colossus down at Magic Mountain (which felt more mild to us). The pre lift section also delivers a blend of light airtime combined with laterals before approaching the lift. Do not be fooled by this cute little airtime hill. We were lifted right out of our seats! Train approaches the pre-lift section after feeling like being "launched" out of the station! 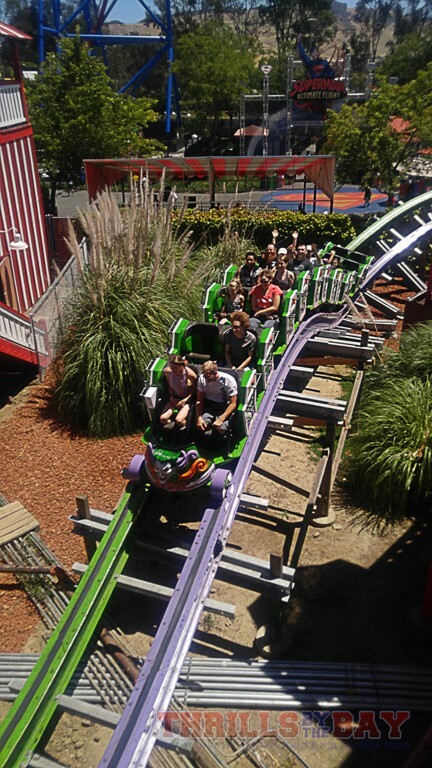 The drop brings you the ride's first moment of ejector air which is best felt in the back. Sitting up toward the front didn't lift us out of the seat much but it did force us into our seats at the bottom of the drop. Following the initial steep drop is the "Step Up Under Roll" or as we like to describe it as an inclined dive loop. The inversion felt pretty unique and smooth and depending on the row you get, you get some nice zero-g moment as you head upward. We found the sweet spot for that moment to be toward the middle of the train. As you exit the roll, you face some nice positive forces as you make way to the stall - which gives you some nice floaty hangtime in any of the rows. 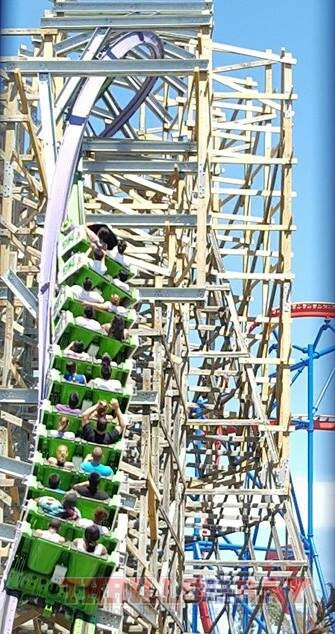 78-degree initial drop, can really feel it in the back half of the train! In the middle, you feel some nice zero-g moments! Our favorite part of the ride, the Zero G Stall! It's like having inverted airtime! Next up is the breaking wave turn which has an unusual outward banked hill ejecting you outward before you are plastered in your seat as you bank hard to the right. Exiting the braking wave turn, you experience a really strong pop of ejector air, followed by another strong pop. The overbank following the hump provides some nice positives. Airtime isn't done yet. 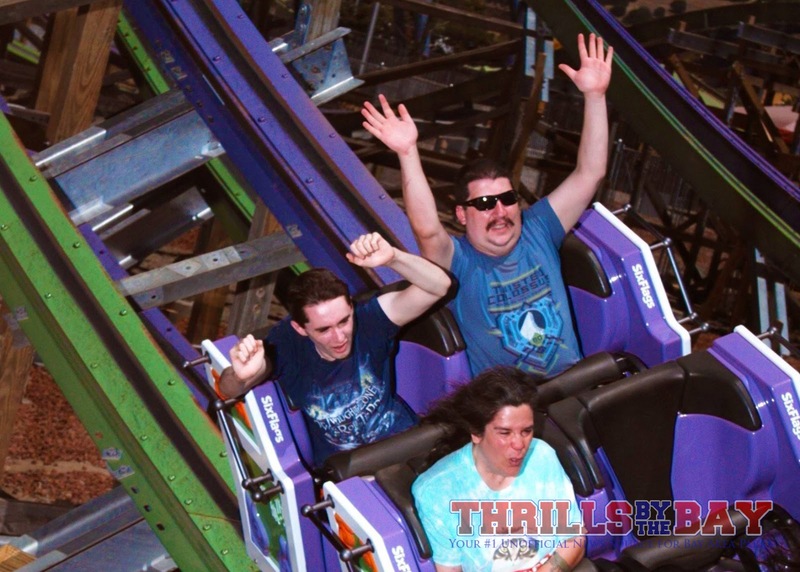 Probably our favorite part of the ride is the double camel back which is literally a 1-2 punch of airtime! After hitting another overbank turn with some nice forces, you float through the final inversion (felt in every row) followed by another sharply banked and forceful turn before you face your final bit of ejector air. As you exit the ride, you do a typical theme park tradition - exiting through the gift shop. In here you can get DC themed merchandise, Joker souvenirs, and your Joker onride photos. 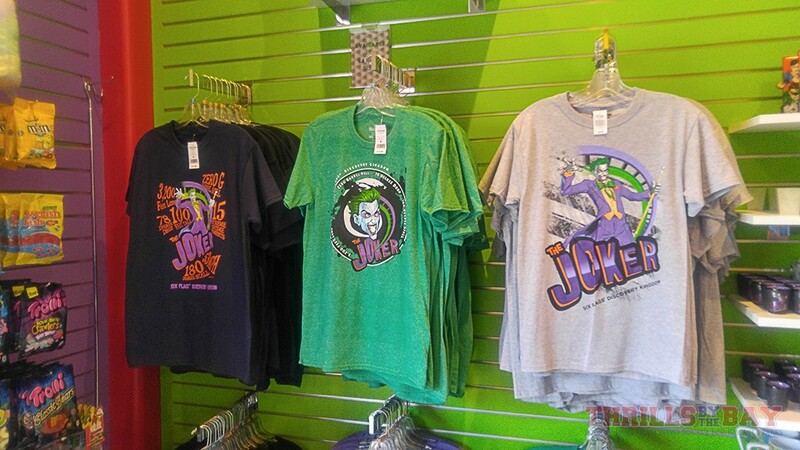 Joker-themed merchandise and some of the very few ride-related souvenir t-shirts you can get at the park. 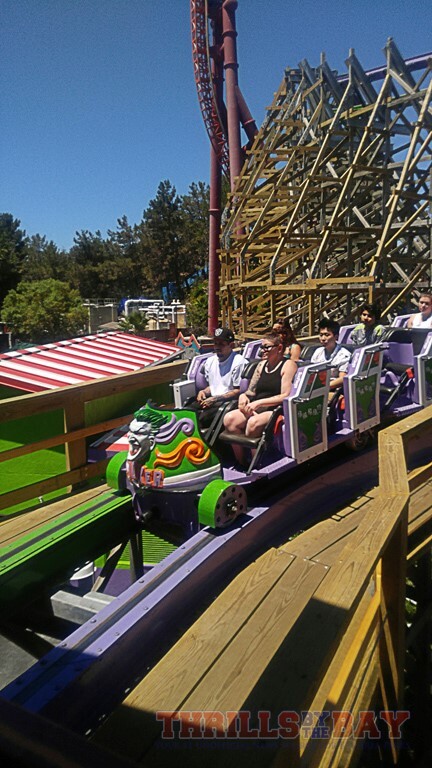 Thrills by the Bay crew taking in a back car ride on The Joker! Joker is insane. We felt like the ride is a good well-rounded coaster with a nice blend of inversions, strong positives and plenty of airtime. 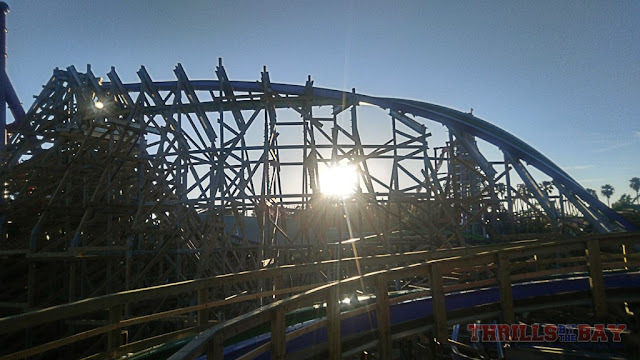 While it's an all arounder, we felt like it excelled in just about every aspect of the ride rather than just being a standard "jack of all trades" kind of ride. Our favorite row was in the back. We encourage you to try out different rows to see what you like the best as each row provides a slightly different experience. 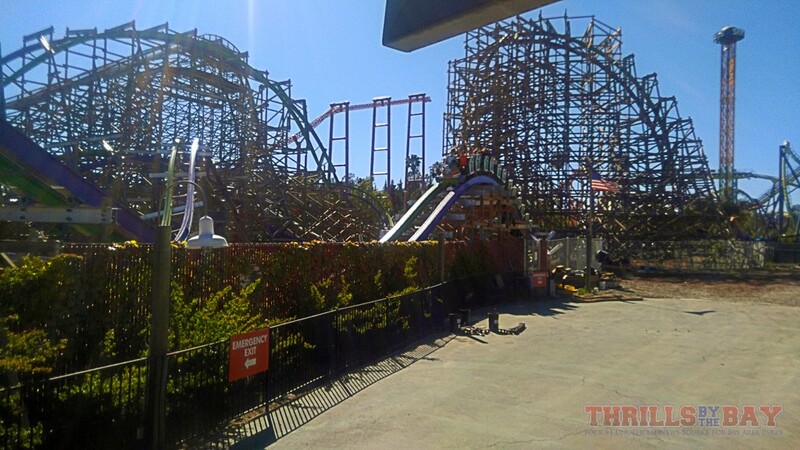 We are very excited and happy to have an RMC coaster literally right in our backyards now. This was RMC's first venture revamping a Great Coasters International twister coaster and we felt like they did a wonderful job using the existing canvas and giving it that RMC flavor. Did you get to experience The Joker? Let us know your thoughts and experiences in the comments below! How did it compare to Roar? 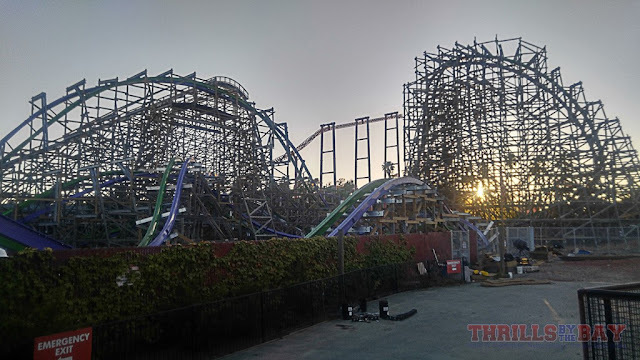 And if you had been on Twisted Colossus (another RMC creation down at Six Flags Magic Mountain), how do you think it compared to that?